Hello everyone! Welcome to the first of what I intend to be a weekly column spotlighting theater in the Greater Cincinnati and Dayton areas. I’m fortunate enough to be able to see lots of shows in the area and want you to have the same luxury … so I will spend time telling you what to go see and how to see it! This weekend I was able to see three different shows. One has already closed and that’s a shame because it was an incredible little piece of theater. Mad Anthony Theater in Hamilton presented Light Sensitive, featuring Daniel Britt, Bekka Eaton, and Burt McCollum. It was full of very strong performances and brilliant writing. A friend of mine said he thought it was the best thing he’d seen this year. Maybe they’ll revive it someday. I also saw Slasher at the Falcon Theater in Newport. It’s a play spoofing modern horror movies. Dee Ann Bryll and Tara Williams are delightfully funny and the show isn’t overly gory or scary. I don’t know if its something everyone would love but it’s certainly an option if you want something fun to do this weekend. 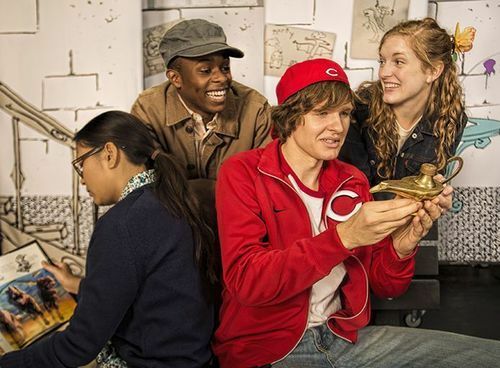 Finally, I was able to catch the Cincinnati Playhouse in the Park’s Off-The-Hill children’s show, Fake Flowers Don’t Die starring the very strong ensemble of Jon Kovach, Justin Weaks, Meggy Hai Trang, and Britian Seibert. I wasn’t sure if this was going to be enjoyable as an adult, but I I laughed and was moved to tears more times than I imagined. It’s a free show and you should check out their schedule here. It’s a great way to introduce children to theater and could lead to some very healthy “teachable moments” for those in attendance. There’s a ton of shows opening this weekend, including Cabaret at the Playhouse in the Park, Oklahoma at Wright State University in Dayton, and a show featuring a new partnership between Xavier University and the Cincinnati Shakespeare Company, The Crucible. Speaking of the Cincinnati Shakespeare, continuing this week is Of Mice and Men. Plus, Rapture, Blister, Burn at the Ensemble Theater, Seven Spots on the Sun at the Playhouse, and The Whale at the Clifton Performance Theater all end their runs this week. All of these have gotten high marks from the League of Cincinnati Theaters. Whatever you do, get out and support local theater this week! There’s a lot more shows to see, so make sure you check out Rob Bucher’s thorough listing here. Follow the League of Cincinnati Theatres by clicking here. And finally, follow us on Facebook by clicking here.